Orange and Cranberry are such wonderful flavors, especially during the winter and holiday months. I recently made a Lemon Blueberry Pound Cake that has been tried by many of you wonderful readers. It continues to win countless rave reviews for its delicious flavor and moistness. One of my Facebook viewers suggested doing an orange and cranberry version and I could not pass that idea up! This cake is bursting with delicious flavor! The cranberries bring a tartness that provides a balance with the sweet. We absolutely loved this pound cake! This cake makes for a delicious neighbor gift or tasty holiday treat! It is sure to be a hit! 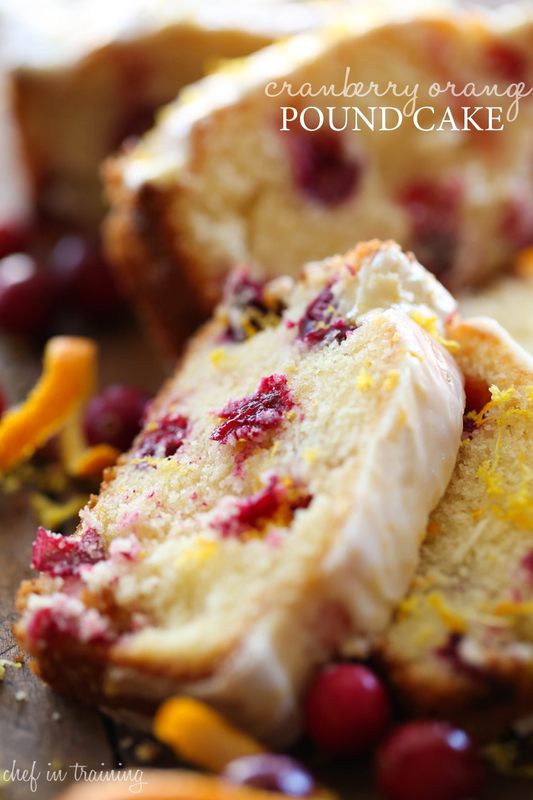 This Cranberry Orange Pound Cake is so moist and is perfect for the winter and holiday season! In a large bowl, cream butter, sugar and orange zest together for 3 to 5 minutes. Add eggs one at a time and beat an addition minute per egg. Add vanilla and mix in. In a separate large bowl, mix and combine dry ingredients together. Add dry ingredients alternatively with the buttermilk to the butter/sugar/orange zest/egg mixture. Fold in cranberries. Grease and flour either 2 large bread pans or 3 small bread pans. Pour batter and bake at 350 degrees F for 55 to 60 min. Let loaves cool and pour glaze over them. Whisk glaze ingredients together until smooth. This is such a pretty poundcake, Nikki! Cranberries + oranges are the best! I used to make a cranberry sauce with oranges and mango in it. I wish I could have a slice of this cake right now. Pinned! Do you need to make adjustmnets for higher altitude? I didn't and it worked perfectly! Hi! I have to say I LOVE all of your recipes I have made! Simple, yet full of flavor! Could this be made in a bundt pan? I used a bundt and it came out perfectly! Should the cranberries be chopped? should the glaze go on while the cake is still warm or wait until it cools ? Bundt pans are nicer for loafs..look fancy and slice much nicer. Ah I absolutely love this! Orange and cranberry is one of the BEST flavor combinations. Pinned! I love cranberry and orange together. I will have to make this for my co-workers. Thanks for the recipe! Yum, yum, yum!! What do you consider large and small pans?? Yes... What size loaf pans?? I have someone that wants me to make several for gifts and wants to freeze them. Do you think these will freeze with the glaze on them? This looks great. Do you cook the cranberries first before folding them into the batter or raw and uncooked? I can't wait to try this. do you use regular milk or buttermilk? The list of ingredients says milk but the recipe says buttermilk. nevermind - I just reread it - you need both! I was wondering if buttermilk is a required liquid or if there is a substitute for those of us who do not like buttermilk? Hey there, you don't seem to add the vanilla in the cake portion of his recipe. I added it after the eggs, since that's where it's at in the recipe. Made this for the first time and brought it to a recent brunch. It was delicious and a big hit. I love that it made two pound cakes. I just need to know if I can freeze the second one for Thanksgiving. I see vanilla both for the batter and the glaze. However, I do not see it in the instruction section for the batter. I'm thinking oversight and just add to wet ingredients? just the zest of an orange. I just use a zester and zest the rind off :) Hope that helps. Please let me know if you have anymore questions. Can a sugar substitute ( such as Splenda, or Truvia ) be used for the pound cake? I make orange cranberry bread every Christmas so I can't wait to try this. I have a "4 mini" cake pan that I plan to use. Sounds delish!! Can you use frozen cranberries? Is it possible to use dried cranberries please? I've used rehydrated cranberries, which worked just fine. the flavor isn't as intense. but if they are not in season it works. a whole year later, but the information may be helpful for future recipes...Christine, an emergency substitution for buttermilk is: 1 tablespoon lemon juice or vinegar plus sweet milk to make 1 cup (let stand 5 minutes). So, this particular recipe would call for 1/4 tablespoon of lemon juice or vinegar combined with enough regular milk to bring the liquid to 1/4 cup. I came across your recipe on Pinterest and made it this evening. The flavors are so bright and fresh with the right amount of sweet and tart. I can't wait to try the lemon-blueberry version! Pls adv dimensions of large and small bread pans. Want to get it right! Thx! Pls adv the sizes of "large" and "small" bread pans. Thanks. Could this be frozen before adding glaze? Looks beautiful and so Christmasy. I make a similar recipe from the children's book, A Cranberry Thanksgiving, fits perfectly into three mini pans. I made this cake last year five times before cranberries disappeared from the shelves. This year I have stocked my freezer so that we can enjoy it all year long. Best seasonal pound cake EVER! Could you substitute dried cranberries? My local grocery didn't have fresh. Made this last night for the holiday season and WOW! It is so amazing. I will be trying the lemon blueberry pound cake after Christmas without a doubt. Thank you!! Could not get the bread out of pan even tho I sprayed. Making for Christmas breakfast and not happy! Didn't know about glaze either - before or after. Probably when warm would be better as it just sat there on my mess. Next time will use Crisco and flour. Mmmmm this came out so good! I only had one 8.5x4.5 and one 9×5 loaf pan on hand, so used those sizes and just took the smaller pan out at about 45 minutes. Both loaves came out perfect! Having said that, I think two 8.5x4.5 loaf pans would have been perfect for this delicious treat! Writing you from Ecuadro! Love your blog. 1. Can i use dried cranberries? 2. Should the glaze go on while the cake is still warm or when is cool? Would frozen or dried cranberries work? Which would work better? It sounds decadent, especially around the Christmas holidays. It reminds me of the Orange Cranberry Shortbread I make at that time of year. They're delicious and just melt in your mouth! I added a small handful on dark chocolate chips and it got rave reviews! At 7000 feet I didn't make any adjustments. This recipe is amazing and fairly simple! I couldn't believe the velvety creaminess of the batter. I have never baked anything with such a beautifully smooth batter. I've used rehydrated cranberries as well as dried. When I've used dried I add just a little extra buttermilk s that my cake don't turn out dry because of the cranberries soaking up all of the liquid. This is a great recipe, and thank you for sharing. I've made this numerous times and everyone loves it! Can't get enough of it so I usually have an extra one in the freezer. I was thinking of making your Cranberry Orange Pound Cake as gifts for our Thanksgiving guest. So my question is can they be made and frozen till the day? Thank you so much for sharing this recipe! It is such a flavorful cake, that I cannot wait to make it each fall! Can I substitute a bundt pan for the loaf pans? It's a lovely recipe, but I can't figure out when they are finished. Can you give the measurements for loaf pans and/or the temp when done. (Like 190•f for bread) ? That would be so wonderful! Sometimes my glazes are transparent, what am I doing wrong? This would be awesome in my christmas trifle instead of the store bought golden pound cake I've been using. Going to bake some and try it this Christmas! I'm getting ready to make this for Christmas Day brunch. Do you know how long it will stay fresh in the fridge? This pound cake looks delicious.I will make it soon with the cranberries. This is an excellent cake. Our daughter made this & baked it in a bundt pan. I would give this recipe a full 5 star rating. This is one of the best and easiest cakes to make. I have made it a lot and EVERY time I do, someone asks for the recipe. Thank you! Thank you so much for this recipe. It is delicious. I had a cup of cranberries left and made an easy sauce to serve with the cake. Just made this recipe. Wow! So good. Tried other pound cake recipes and they come no where as good as this.